Background: Only one manganese peroxidase from Musa paradisiaca leaf has been purified and characterized but from other plant sources are still to be reported with efficient manganese peroxidase activity. Objective: To assay enzyme activity and to study the enzymatic properties like Km, pH optima and temperature optima of the manganese peroxidase present in Luffa acutangula fruit juice. To study the nature of inhibition by different inhibitors on manganese peroxidase. Method: Fresh L. acutangula fruit was cut, crushed, squeezed and centrifuged to get the clear juice extract. 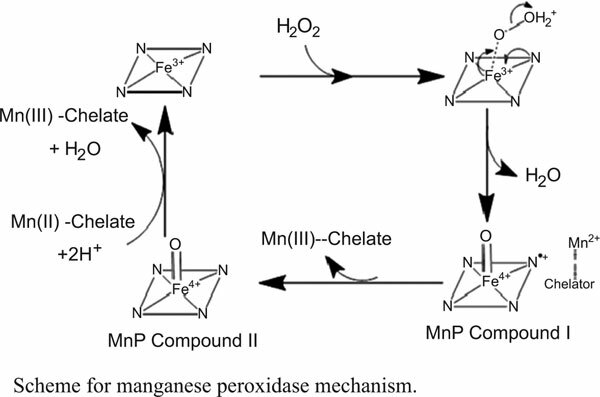 Manganese peroxidase activity was assayed and the steady state enzyme kinetics of the MnP catalysed reaction was studied spectrophotometrically at λ=270nm. The pH optima and the temperature optima of the enzyme was determined by measuring the steady state velocity of enzyme catalysed reaction in reaction solutions of varying pH and at varying temperature. The steady state velocity of enzyme catalyzed reaction was monitored at different concentrations of inhibitors. Results: The Michaelis Menten constants for the enzyme for Mn(II) and H2O2 were 22µM and 20µM. The pH and temperature optima of the enzyme were 4 and 22 °C. Sodium azide showed uncompetitive type whereas ethylenediamine and ethylenediamine tetra acetic acid showed competitive type of inhibition. Conclusion: It is the second manganese peroxidase reported from a plant source. The enzymatic properties are similar to manganese peroxidase from Musa paradisiaca stem juice and other reported fungal manganese peroxidases. Manganese peroxidase, ligninolytic enzyme, Luffa acutangula, Phanerochaete chrysosporium, Musa paradisiaca, stem juice.